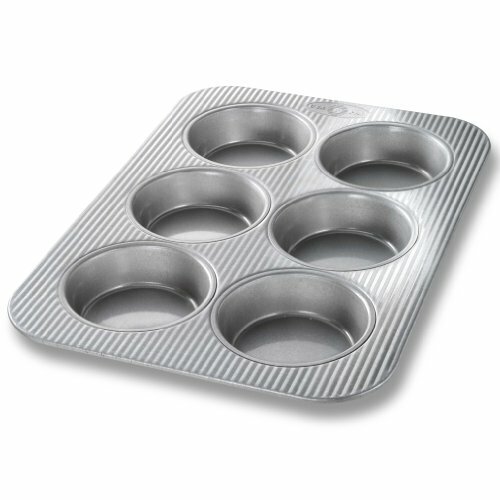 The USA Pan 6-Well Mini Round Cake Pan measures a full 4.25 x 3.75 x 1.5 inches* in each well by baking surface and offers bakers the ability to bake the perfect miniature round cakes. This pan is the perfect size for indulging in up to six decadently delicious miniature cakes. You can bake different flavors like chocolate, strawberry and red velvet, while adding a personal flair to each individual mini cake for your friends and family. The pan surface is coated with a patented AMERICOAT Plus coating, a non-stick silicone, allowing you to easily release your baked goods from the pan. AMERICOAT Plus is PTFE, PFOA and BPA free. Every USA Pan is made in the USA and has been designed with the same standard high performance features that commercial bakers enjoy including aluminized steel and heavy gauge steel construction that allows for even heat distribution and maximum service life. USA Pan 6-Well Mini Round Cake Pan unique fluted panel surface design facilitates air circulation and also maximizes pan strength, which helps to resist warping. USA Pan bakeware is long-lasting, durable, reliable, and comes with a limited lifetime warranty. USA Pan’s professional grade bakeware helps everyday home bakers produce professional grade baked goods. USA Pan is a Bundy Family owned company, based in the Greater Pittsburgh, Pennsylvania area that has been producing high performance bakeware for over 50 years. *Dimensions represent baking surface, not overall pan size.